Marge Simpson, like most sitcom mothers, most often functions as the stable pillar around which the family chaos swirls. 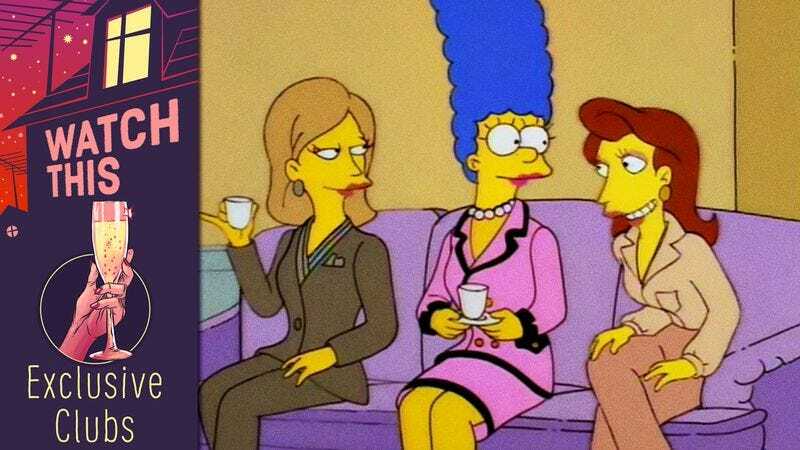 While the strongest episodes of The Simpsons are smart enough to play with that often thankless role in a way that’s both stranger and more heartfelt than most conventional TV shows, Marge still remains the somewhat anxious, nagging calm at the center of the storm. “Scenes From The Class Struggle In Springfield” is one of the rare episodes that indulges in Marge’s capacity for poor decision-making. It’s a rare enough theme that Homer even comments on it in “$pringfield” (season 5, episode 10), when Marge’s gambling problem causes him to reflect, “You know, Marge, for the first time in our marriage I can finally look down my nose at you.” But here, Marge’s failings are an extension of her sense of self as someone who’s nurtured a good family. When Lisa finds a Chanel suit at the Ogdenville Outlet Mall, Marge gives in and buys it, despite having nowhere to wear the designer outfit. Marge’s more-successful friend from high school, Evelyn, sees Marge pumping gas in the suit and, assuming she’s earned an equal level of status, invites her to visit the Springfield Country Club. The promise of inclusion consumes her. It’s not class envy that drives Marge’s ambitions; she’s completely unconcerned with the material trappings of Springfield’s elite. It’s the inferred respectability club membership bestows that’s so attractive to her, the idea that being accepted into the cold, elegant fold of Evelyn and her friends will be the proof Marge needs that she’s raised a successful, functional family. Of course, the central hitch to making this all happen is to somehow browbeat the rest of the family into behaving completely differently in order to earn a place at the club. Lisa is told to stay away from political conversations (“I told you I don’t like you using the word hotbed”), Bart can’t practice grifting, and Homer, at the very least, has to wear long sleeves with his tie. And of course, Marge needs to keep wearing the Chanel suit, the disguise that allows her to stay among Springfield’s best. Marge eventually realizes how alienated her pursuit of the country club has left her from her family, and abandons the membership for a dinner at Krusty Burger instead. When Squeaky-Voiced Teen asks what a fancy-looking family is doing there, Marge responds that they just feel more comfortable there. Squeaky-Voiced Teen nods along with the sentiment for a moment before declaring that thought crazy. Krusty Burger is, after all, a dump. There’s no need to throw away your identity in vain pursuit of false respectability, but perhaps aspiring toward something a little better in life isn’t a terrible idea, either. Availability: True to the marathons’ names, every Simpsons episode ever is housed at Simpsons World.